by Mariam Fam, Associated Press Writer. November 20, 2003. KIRKUK, Iraq (AP) � A bomb apparently hidden in a pickup truck exploded Thursday at the offices of a U.S.-allied Kurdish political party in this northern oil center, killing five people and wounding 40, including children. It was the second car bombing in as many days targeting Iraqis who cooperate with the U.S.-led occupation. Mayor Abdul Rahman Mustapha said �all indications point� to a suicide attack, because one unidentified body could be the driver. Elsewhere, a pro-U.S. politician was assassinated in the southern city of Basra and gunmen killed an Iraqi guard at the Jordanian Embassy in Baghdad. The U.S. military reported U.S. forces killed 10 Iraqis north of the capital after being attacked. The explosion in Kirkuk occurred at about 10:30 a.m., said Jalal Johar, an official with the Patriotic Union of Kurdistan. It shattered windows and damaged doors at the two-story, yellow-and-green building and blew out the windows of the nearby radio and television station. The blast happened at about the same time as deadly bombings in Istanbul, Turkey, where the London-based HSBC bank and the British consulate were the targets. The twin attacks � blamed on al-Qaida � coincided with President Bush state visit to London. U.S. troops killed 10 Iraqis in Samara, 60 miles north of Baghdad, after gunmen attacked a coalition convoy on Wednesday, Lt. Col. William MacDonald said. Two attackers died in the initial exchange of fire. Eight were killed when gunmen attacked U.S. reinforcements, who returned fire with M-1A1 Abrams tanks and an Apache helicopter, MacDonald said. Iraqi witnesses said some of the dead were civilians caught in the crossfire. In Kirkuk, security guard Assad Ahmed said he saw the pickup moving before the blast but he was unsure if the driver was inside when it exploded. Johar said security had been bolstered around the building because of intelligence reports that an attack was likely. No group claimed responsibility for the attack in Kirkuk. The PUK supports American efforts in Iraq and its chief Jalal Talabani now heads the U.S.-installed Iraqi Governing Council. One of the party's regional rivals in the Kurdish area, Ansar al-Islam, is believed to have ties to al-Qaida. Some U.S. officials suspect Ansar al-Islam is working with Saddam loyalists, including Izzat Ibrahim al-Douri, former vice chairman of the Revolutionary Command Council. U.S. officials have offered a $10 million reward for al-Douri's capture. Late Wednesday, a car bomb exploded outside the home of Sheik Amer Ali Suleiman, a tribal leader in Ramadi, about 60 miles west of Baghdad. Hospital workers said Thursday that two people were killed. Suleiman is a leader of the Duleim, one of the largest Sunni Muslim tribes in Iraq. He also is a member of the city council and is close to the Americans. Guerrillas repeatedly have attacked police stations and Iraqis perceived to be cooperating with the occupation. The Assyrian Democratic Movement in Basra said its member on the municipal council, Sargon Nanou Murado, was abducted Tuesday and that his body was found Wednesday. 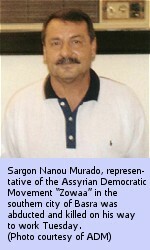 The group representing Iraq's Assyrian minority also is on the 25-seat Governing Council. The assassination is the second this week of people working with coalition authorities in southern Iraq. In the town of Diwaniyah, gunmen killed an education ministry official on Tuesday. In Baghdad, two gunmen opened fire before dawn Thursday outside the new Jordanian Embassy, killing an Iraqi security guard, police said. Iraqi police officer Hatim Abdul-Karim said witnesses told police two attackers opened fire and fled at about 5 a.m. The Jordanians moved to the new chancellery after an Aug. 7 car bombing killed 19 people at their former embassy. An American general said Wednesday the United States stepped up its offensive against suspected insurgent targets to intimidate the guerrillas. �We felt that the enemy had begun to act with a little more impunity than we want him to have,� said Brig. Gen. Martin Dempsey, whose troops are responsible for security in Baghdad. U.S. officers said that 161 people �suspected of anti-coalition activities� were detained Wednesday in northern Iraq by the 101st Airborne Division. Detainees included a member of Ansar al-Islam, the military said. The aggressive tactics followed an upsurge in guerrilla activity and a sharp rise in the number of coalition casualties. About 70 allied soldiers have died in November, just short of the toll in April, when 73 Americans died. President Bush declared major combat over May 1.